Images: Ian Roman / Team Origin , Ricardo Pinto / ACEA. Clips: TNZ & ACEA - No foiling today at Porstmouth but great racing the same on a sailable course. Code zeros were up to windward and downwind legs. For many of us F18 sailors you can relate a lot on this type of racing, like the excellent first 45 series, and its pretty interesting to watch and try to learn. Also today for the Tornado sailors present at Beijing with the US Team 'Chupacabra' project. The problem is when you organize a carousel course a la Extreme series between the highest skycrapers in the World as done in NY this year. 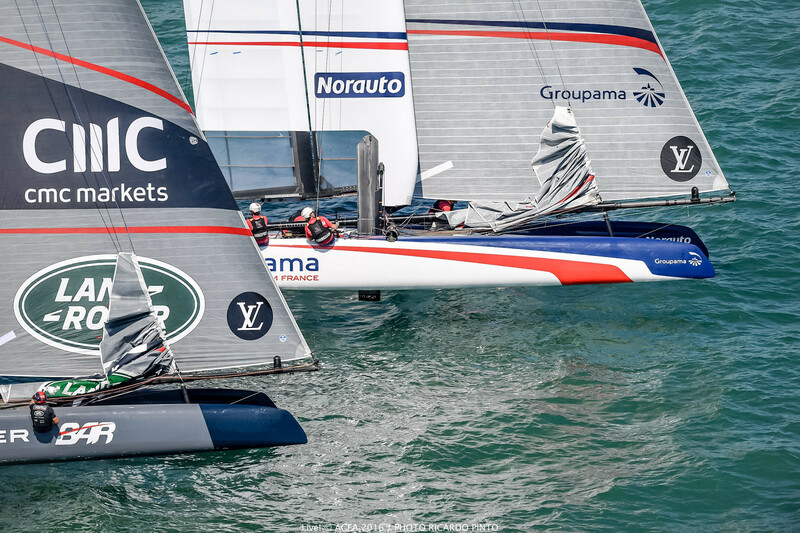 Ainslie and Cammas got the best of the day, with Team France having winning and recovering in great shape in race 3. Cammas had the best starts of the day, while the rest were filled by penalties. Replacement helms in Artemis & NZ , Bruni & Ashby, cound´t show their best today, but it was tricky. Barker Team Japan holding well in the pack. Porstmouth per race & overall, Official web: americascup.com/en/results.html. All this was seen live , NOT courtesy of ACEA or ESPN Play/GO, as it was not streamed down here, though espn has the rights and broadcast at least one stop this year. Below official press release and the 1 min wrap up above to get the masses eager to move to those countries where is possible to watch the stream live. I think it's world hidden power plan for immigration purposes... Even TNZ gets us lengthier clip. Link to verify if the stream can be seen in your country here. "Hot, sunny conditions and thousands of fans lining the Portsmouth seafront was the backdrop to Saturday’s crowd-pleasing Louis Vuitton America’s Cup World Series action, the first day of points scoring races on the Solent at the 2016 event. The home team, Land Rover BAR, led by skipper Sir Ben Ainslie, recovered from a poor first race result to win the second two contests and complete the day at the top of the leaderboard, much to the delight of the tens of thousands of cheering fans lining the shorefront. extra impetus. We’ve been training hard, preparing thoroughly and the guys are really fired up for it,” said Land Rover BAR skipper Ben Ainslie. At the start of race one it was Land Rover BAR and Groupama Team France who led the pack, Softbank Team Japan in third and Artemis Racing, ORACLE TEAM USA and Emirates Team New Zealand all incurring penalties as they crossed the start line fractions of a second too early. The French team made a tactical decision heading to Gate 2 that really paid off and quickly built a good lead. The battle behind the French was fierce, with boats making contact as the light conditions tested the crews to the limit, but at the finish line it was Groupama Team France in first, ORACLE TEAM USA recovering to second and Emirates Team New Zealand in third. Behind them, a drag race for fourth between Softbank Team Japan and Land Rover BAR was finally settled in favour of the Japanese on a photo finish, with Artemis Racing bringing up the rear in sixth. Race two was another penalty-fest at the start, with every team except Groupama Team France incurring penalties for crossing the line before the gun, but the pack quickly caught up with the French team and at the bottom mark the home crowd went wild as Land Rover BAR took the lead. Ben Ainslie’s crew strode into a huge lead, and from that point they put on an America’s Cup racing masterclass, making the best use of the light winds to finally finish first, over a minute ahead of ORACLE TEAM USA, who again fought back from a poor start to finish in second. 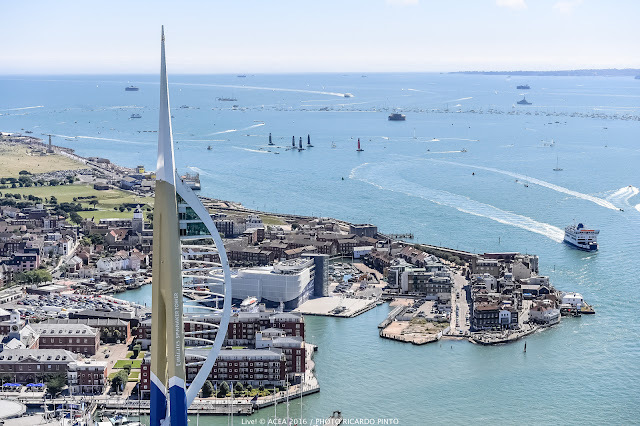 Behind them, Softbank Team Japan finished third, Groupama Team France in fourth and the two boats with new helmsmen in Portsmouth, Artemis Racing and Emirates Team New Zealand crossing the line in fifth and sixth respectively. The third and final race of the day saw another good start for a French team who were the standout performers on the start line today. 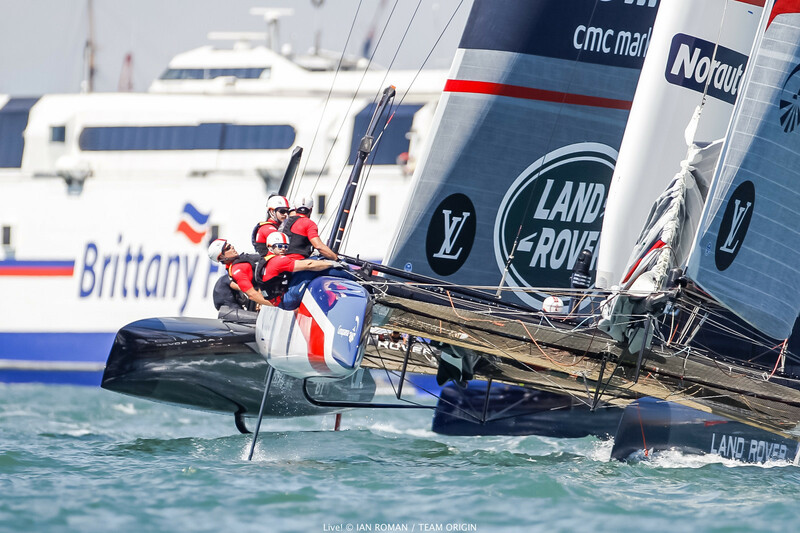 Land Rover BAR kept up their race two form, but both ORACLE TEAM USA and Softbank Team Japan again incurred startline penalties and were playing catch up from the start. The Japanese team, under the leadership of Dean Barker, made up ground impressively and were right with Groupama Team France at the halfway point of the race, battling with Land Rover BAR for second as the French inched ahead. 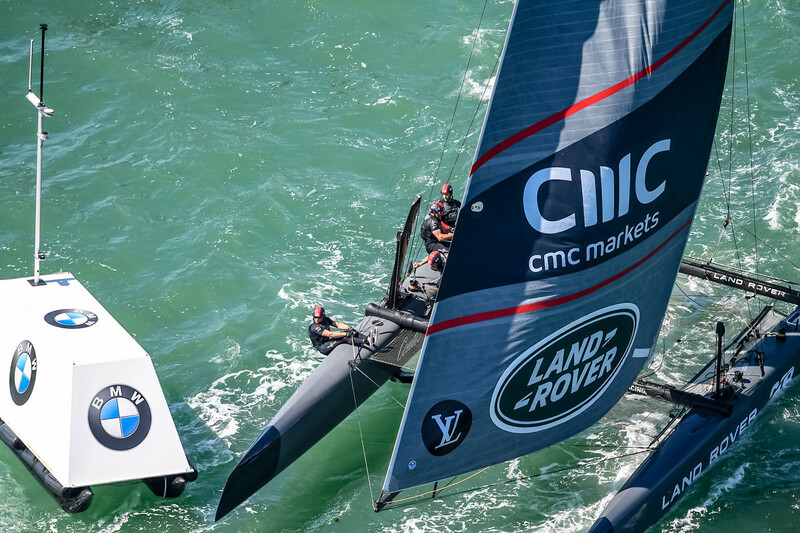 However, an incredible fight back from Ben Ainslie’s British boat saw them overtake the French boat at gate 3 and then they found themselves stuck into a huge battle with Softbank Team Japan as they sped towards the final leg. Finally it was another win for Land Rover BAR, an impressive second for Groupama Team France, third for Softbank Team Japan, fourth for Emirates Team New Zealand and Artemis Racing and ORACLE TEAM USA in fifth and sixth places in the final race of the day. Adam Minoprio, Wing Trimmer, Groupama Team France: “Tough conditions today, a lot of light patches and with the sea breezes coming around the Isle of Wight it was tricky conditions out there. However, we’re very happy with our performance today. In all the races today Franck and Thomas (Le Breton, Groupama Team France Tactician) made sure we had really good starts, they worked hard to get us right on the line and I think we were leading at the first mark in all three of the races today. It was a good day for them, wherever we were. “The level here is world class and even though we’ve obviously made some gains, every other team is also improving. The key is to find those last few percentage gains and make sure we are putting them into action everywhere, not just on the first day of points scoring here in Portsmouth. Dean Barker, skipper, SoftBank Team Japan: “It felt like a bit of a tough day. We were over the line in two of the starts and from there we were battling, we really weren’t error free at any point and I think we have a lot to improve on. We still managed to salvage credible results which I think that was key - in the past we may have let this sort of form drag us down, but here we didn’t. That leaves us still in a position with all to play for tomorrow. Paul Campbell-James, tactician, Land Rover BAR: “It was a fantastic day for us. We struggled in the first race but bounced back and to get two bullets in the second and third races was a great result. “It was quite tricky out there, a real day of snakes and ladders, but generally we were moving forward so we’re pleased with that. It’s an unbelievable event, the amount of people that are here, and to hear the cheers from the shore was absolutely amazing. It gives you that extra bit of pep that helps you pull those sails in a bit harder, and it’s incredible for a sailing event that we can hear support like that. Jimmy Spithill, skipper, ORACLE TEAM USA: “It was pretty tough out there, with the conditions and trying to keep clear of the other boats. I thought we sailed better than yesterday, but we still have a way to go. We’ll go back tonight, look at our mistakes and tidy it up. 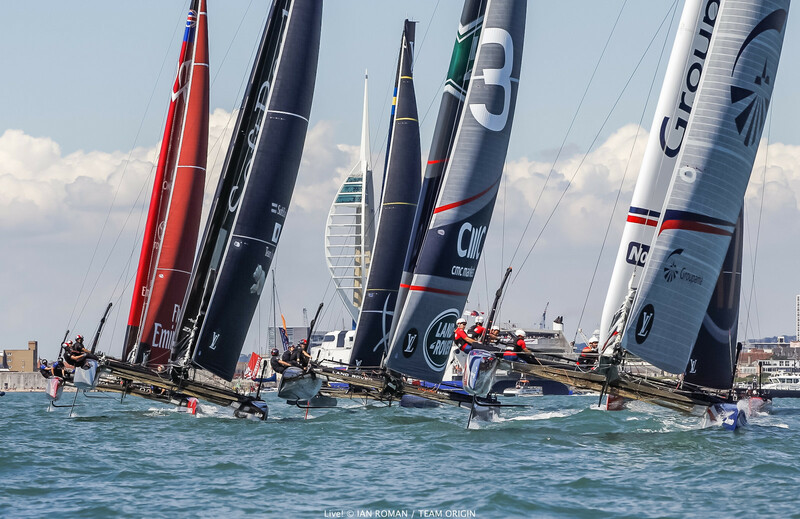 Iain Percy, tactican, Artemis Racing: “It was a terrible day for Artemis Racing. We really didn’t sail as well as we can so we’re disappointed with our performance. We’re frustrated, but fortunately it’s double points tomorrow so it’s still all to play for. A lot of people took some painful lessons today, and we probably took more than our share. 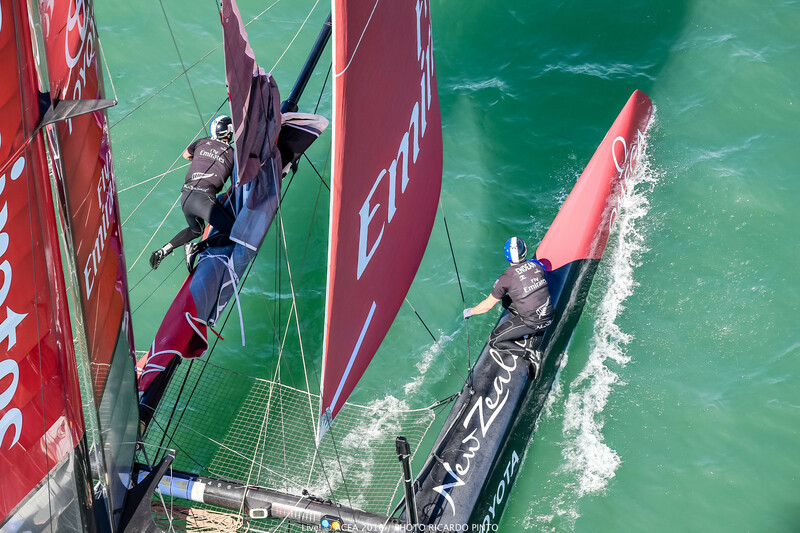 Ray Davies, tactician, Emirates Team New Zealand: “It was tough out there, it’s a short course and we were on the big code zero sail the whole time so that puts a lot of pressure on the crew work. I think Land Rover BAR seemed to be more polished than the rest of us on that aspect of racing today and that was the main difference for them.